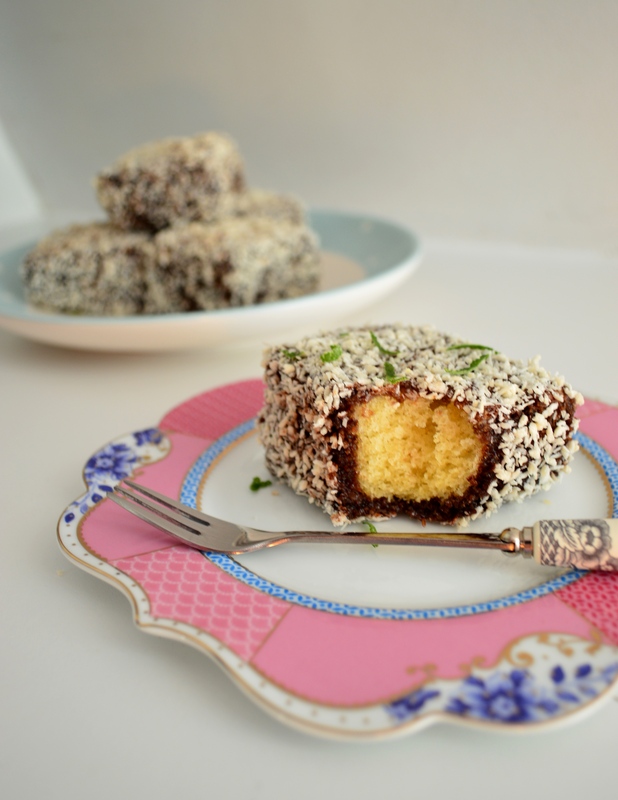 If you have never heard of a Lamington before, then that might be because they come all the way from Australia – small squares of light, fluffy sponge, dipped in a dark chocolate icing and rolled in coconut. The icing (made with our Sugar and Crumbs Chocolate Lime cocoa powder in this case, for a zesty kick) makes the cake beautifully moist. 1 – Start by baking the cake. Preheat the oven to 200°C (180°C fan). Break the eggs into a bowl and beat together with the margarine. Add the sugar, beat again, and then repeat with the self-raising flour and the baking powder. 2 – Grease a deep square brownie tin and line with greaseproof paper. Fill with the cake mixture, spreading it out so it’s roughly even (and being sure to push it all the way into the corners) and then bake for 22 minutes, until risen and golden. Leave to cool completely – I’d actually recommend leaving it overnight, so that the cake has a chance to firm up a little. This will make it easier to cut up. 3 – To make the icing, mix together the icing sugar and Sugar and Crumbs Chocolate Lime cocoa powder, and then stir through the boiling water to make a thick paste. Add the melted butter, and finally the milk, mixing really well to make a smooth icing. 4 – Get everything ready for the icing stage – sprinkle a thick layer of desiccated coconut on a plate, and cover a baking tray or board with greaseproof paper ready for the finished cakes. Clear a space in the fridge for them to set afterwards. 5 – To ice the cakes, simply dip in the icing, making sure to cover them completely, then roll in the coconut and lay on the prepared baking tray or board. You may find it helps to do the chocolate icing with one hand and the coconut with the other, to prevent the end result being too messy! 6 – Once all of the cakes are decorated, place the tray or the board in the fridge for an hour or so, to set the icing.